Black ice on a lake, fast-frozen with no snow, is a unique natural element. Massachusetts state geologist Steve Mabee, and UMass colleagues, marvel at the ice on Metacomet Lake in Belchertown, Massachusetts, on January 18, 2019. Raymond Langevin glides on the black ice on Metacomet Lake in Belchertown, Massachusetts. At rear, from left, on the ice: Dave Marks, Kate Popetz and Anna Morningstar. At foreground: Rachael Tani. From left to right: Dave Marks, Anna Morningstar and Kate Popetz on Fitzgerald Lake in Northampton, Massachusetts. With slight shifts in temperature on remarkably smooth ice, audible cracks cut across Lake Warner in North Hadley, Massachusetts, before the mid-January snow. The ice on Metacomet Lake in Belchertown, Massachusetts, groaned occasionally on January 19, 2019. With slight shifts in temperature and remarkably smooth ice, loud cracks cut across Lake Warner in North Hadley, Massachusetts, in mid-January, 2019. Ice on Lake Warner in North Hadley, Massachusetts. 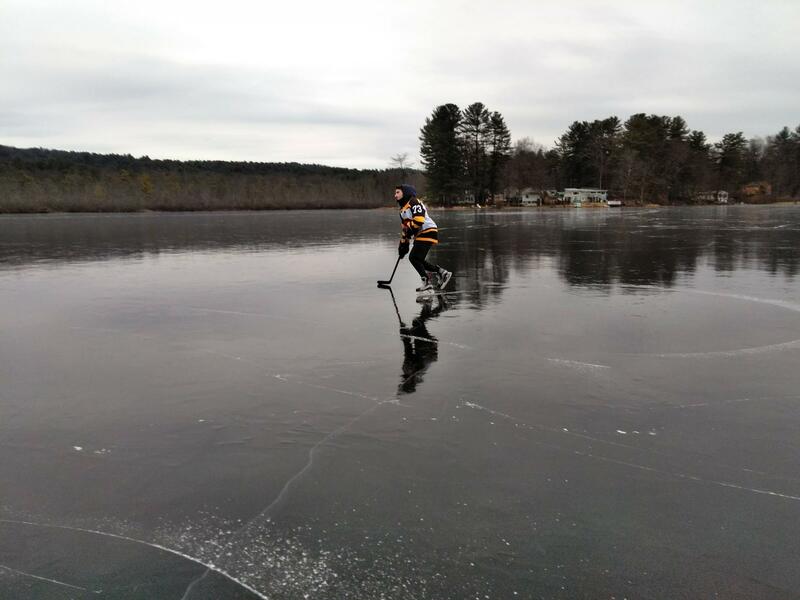 A few weeks of dry, cold January weather in western Massachusetts created ponds that were frozen sheer and smooth — like panes of glass — for the first time in years. If you've lived in New England long enough, you know that ponds and open water freeze over differently year to year, depending on the weather. 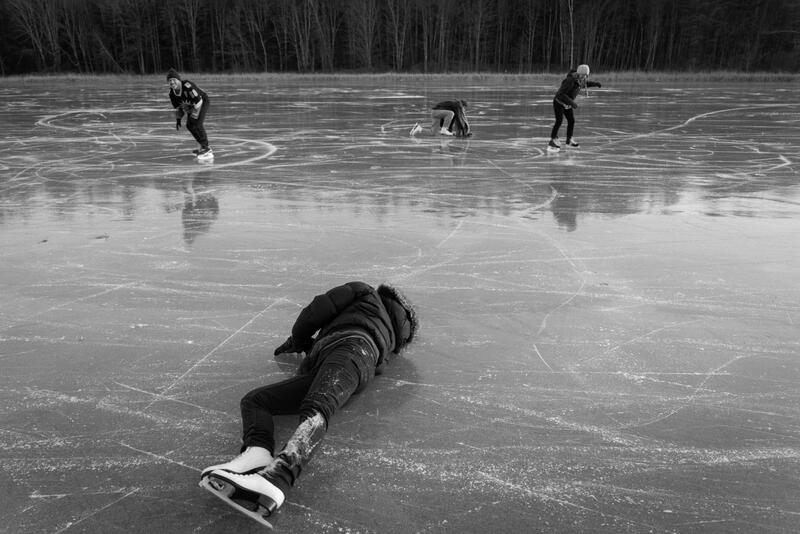 On Lake Warner in North Hadley, Massachusetts, the skating was remarkable. The black ice was so clear that every crack was visible — and audible. The sound can be scary, especially if you're out in the middle of a lake alone… with a microphone. But some people can't help themselves. 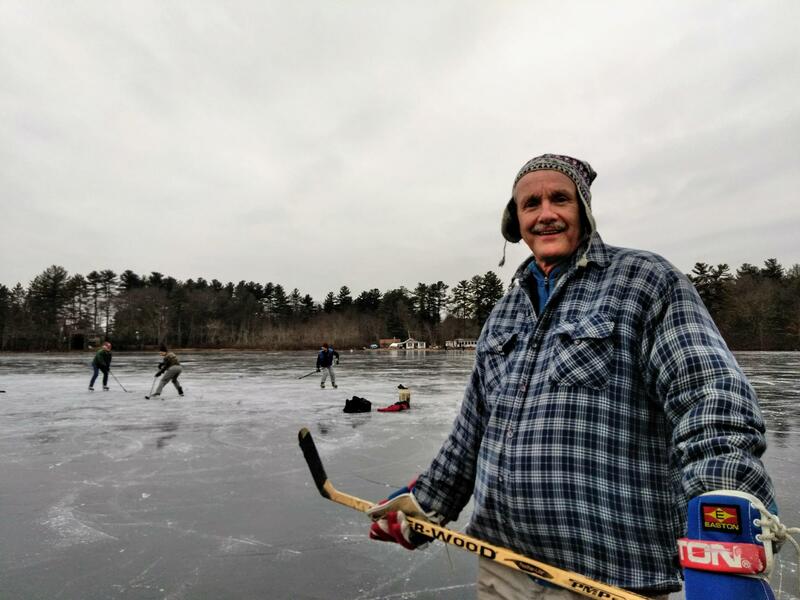 On a recent Saturday, Massachusetts state geologist Steve Mabee, skates on and hockey stick in hand, was one of the biggest kids out on Metacomet Lake in Belchertown, Massachusetts. Mabee made sure the entire UMass geosciences department knew how good the ice was — and some of them were also came out to skate. Water is sort of contrarian. It’s at its highest density when it’s still liquid, at 4 degrees Celsius, Mabee said. That's just under 40 degrees Fahrenheit. Most materials are at their maximum density when solid, and they expand when they're heated, Mabee said — like railroad tracks, which are made of steel. But not water. “Water expands when it freezes,” he said. When water hits 0 degrees Celsius, or 32 degrees Fahrenheit, it crystalizes. The expansion of the ice causes the groans you hear, and that reverberating soundtrack. And here's a reassuring thing to hear when you're standing far from shore, perhaps a little nervous: A water molecule, H2O, is polar. It has a slight positive charge on one end, and a slight negative charge on the other. No pun intended — but cool indeed. And on this day, perfection. It’s a window into the bottom of the pond, at least at its edges, Mabee said, and he's spent almost his entire life in the Northeast living next to water. When he was a kid, he said, he didn't get off the ice until his mother called him home. Ponds thawed a bit in the last few weeks, and refroze. That perfectly smooth ice is gone — for this season. The cracking will continue. Climate change is expected to hit the Northeast pretty hard, affecting crops, ski resorts and fisheries on the coast. 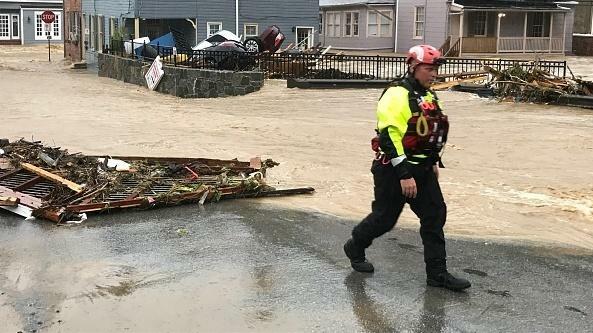 Here are some of our latest New England reports on climate change — from inland floods in New Hampshire, to a Connecticut forest, to a salt marsh north of Boston where there's an invasive plant that just won't quit. What Are The Secrets Of Connecticut's Bobcats? 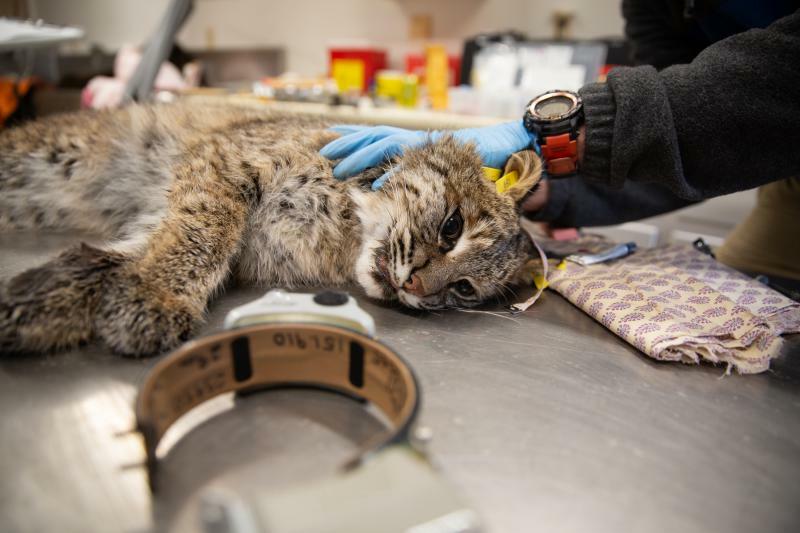 Inside a lab in northwest Connecticut is a bobcat. Its bright eyes and black-tufted ears are separated from me only by the metal grill of a large carrier. She’s sleepy, but waking up. A Vermont Department of Public Service employee drove more than 6,000 miles around the state this fall to test the adequacy of wireless coverage. What he found is now part of a detailed challenge before the Federal Communications Commission that officials hope will bring federal dollars into the state to improve the wireless network.